Please read this document thoroughly. It provides important information that you should be acquainted with before continuing to use our services or software. We reserve the right to modify this Statement at any time by making changes to this page. 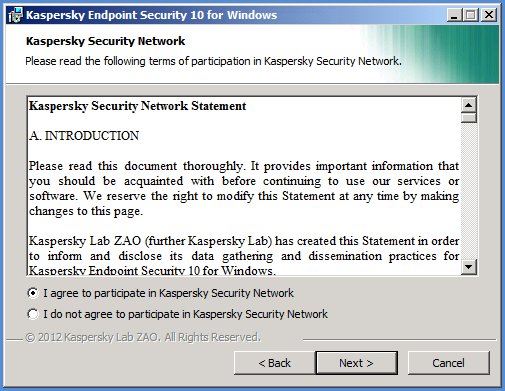 AO Kaspersky Lab (further Kaspersky Lab) has created this Statement in order to inform and disclose its data gathering and dissemination practices for Kaspersky Endpoint Security 10 for Windows. Kaspersky Lab has a strong commitment to providing superior service to all of our customers and particularly respecting your concerns about Data Processing. This Statement contains numerous general and technical details describing the steps we take to respect your Data Processing concerns. Meeting your needs and expectations forms the foundation of everything we do – including protecting your Data. The Kaspersky Security Network service allows users of Kaspersky Lab security products from around the world to help facilitate identification and reduce the time it takes to provide protection against new (“in the wild”) and complex security threats and their sources, intrusion threats, as well as increasing the protection level of information stored and processed by the computer’s user. This information contains no personally identifiable information about the user and is utilized by Kaspersky Lab for no other purposes but to enhance its security products and to further advance solutions against malicious threats and viruses. By participating in Kaspersky Security Network, you and the other users of Kaspersky Lab security products from around the world contribute significantly to a safer Internet environment. Kaspersky Security Network may be subject to the laws of several jurisdictions because its services may be used in different jurisdictions, including the United States of America. Kaspersky Lab shall disclose information without your permission when required by law, or in good-faith belief that such action is necessary to investigate or protect against harmful activities to Kaspersky Lab guests, visitors, associates, property or to others. As mentioned above, laws related to data and information processed by Kaspersky Security Network may vary by country. Kaspersky Security Network shall duly inform the users concerned when initially processing the above-mentioned information of any sharing of such information and shall allow these Internet users to opt in (in the EU Member States and other countries requiring opt-in procedures) or opt out (for all other countries) online from the commercial use of this data and/or the transmission of this data to third parties. Kaspersky Lab may be required by law enforcement or judicial authorities to provide some information to appropriate governmental authorities. If requested by law enforcement or judicial authorities, we shall provide this information upon receipt of the appropriate documentation. Kaspersky Lab may also provide information to law enforcement to protect its property and the health and safety of individuals as permitted by statute. - Information about network connections, including version and checksums (MD5, SHA2-256, SHA1) of the file from which process was started that opened the port, the path to the process’s file and its digital signature, local and remote IP-addresses, numbers of local and remote connection ports, connection state, timestamp of the port’s opening. For additional examination the User agrees to provide files or parts of files that could be exploited by intruders to harm the User’s computer. - URL- and IP-addresses from which the running file was downloaded. In order to promptly detect and fix errors associated with installation, uninstallation, and updating of the product, and to record the number of users, the User agrees to provide information about the date of installation and activation of the software on the computer, type of installed license and its expiration date, identifier of the partner from whom the license was purchased, serial number of license, type of software installation on the computer (initial installation, updating, etc.) and an installation success flag or the installation error number, a unique identifier for the installation of the software on the computer, type and identifier of the application that is being updated, identifier of the update job. - The set of installed software components, including the version of the installed encryption module and the status of each component. - Information about the process executing the attack on the software’s Self-Defense: the name and size of the process file, its checksums (MD5, SHA2-256, SHA1), the full path to the process file and the template code of the file path, the creation/build timestamps, executable file flag, attributes of the process file, information about the certificate used to sign the process file, code of the account used to launch the process, ID of operations performed to access the process, type of resource with which the operation is performed (process, file, registry object, FindWindow search function), name of resource with which the operation is performed, success of the operation. In order to receive the reference information about the number of objects with known reputation, the User agrees to provide information about the version of the protocol used to connect with the Rightholder’s services. - Information about the installed Software, including its full version and type, the software’s locale language, information about the installed updates, the value of the TARGET filter. Kaspersky Lab is committed to protecting the security of the information it processes. The information processed is stored on computer servers with limited and controlled access. Kaspersky Lab operates secure data networks protected by industry-standard firewall and password protection systems. Kaspersky Lab uses a wide range of security technologies and procedures to protect information from threats such as unauthorized access, use, or disclosure. Our security policies are periodically reviewed and enhanced as necessary, and only authorized individuals have access to the data that we process. Kaspersky Lab takes steps to ensure that your information is treated securely and in accordance with this Statement. Unfortunately, no data transmission can be guaranteed secure. As a result, while we strive to protect your data, we cannot guarantee the security of any data you transmit to us or from our products or services, including without limitation Kaspersky Security Network, and you use all these services at your own risk. We treat the data we process as confidential information; it is, accordingly, subject to our security procedures and corporate policies regarding protection and use of confidential information. All Kaspersky Lab employees are aware of our security policies. Your data is only accessible to those employees who need it in order to perform their jobs. Any stored data will not be associated with any personally identifiable information. Kaspersky Lab does not combine the data stored by Kaspersky Security Network with any data, contact lists, or subscription information that is processed by Kaspersky Lab for promotional or other purposes. Kaspersky Lab processes the data in order to analyze and identify the source of potential security risks, and to improve the ability of Kaspersky Lab’s products to detect malicious behavior, fraudulent websites, crimeware, and other types of Internet security threats to provide the best possible level of protection to Kaspersky Lab customers in the future. Kaspersky Lab may disclose any of the information processed if asked to do so by a law enforcement official as required or permitted by law, in response to a subpoena or other legal process or if we believe in good faith that we are required to do so in order to comply with applicable law, regulation, subpoena, or other legal process or enforceable government request. Kaspersky Lab may also disclose information when we have reason to believe that disclosing this information is necessary to identify, contact or bring legal action against someone who may be violating this Statement, the terms of your agreements with the Kaspersky Lab or to protect the safety of our users and the public or under confidentiality and licensing agreements with certain third parties which assist us in developing, operating and maintaining the Kaspersky Security Network. In order to promote awareness, detection and prevention of Internet security risks, Kaspersky Lab may share certain information with research organizations and other security software vendors. Kaspersky Lab may also make use of statistics derived from the information processed to track and publish reports on security risk trends. Kaspersky Lab takes and addresses its users’ Data Processing concerns with utmost respect and attention. If you believe that there was an instance of non-compliance with this Statement with regard to your information or data, or you have other related inquiries or concerns, you may write or contact Kaspersky Lab by email: support@kaspersky.com. In your message, please describe in as much detail as possible the nature of your inquiry. We will investigate your inquiry or complaint promptly. In case of refusal to participate in KSN the above data is not transmitted. The data is processed and stored in a restricted and protected partition on the user’s computer. This data cannot be restored after uninstallation. 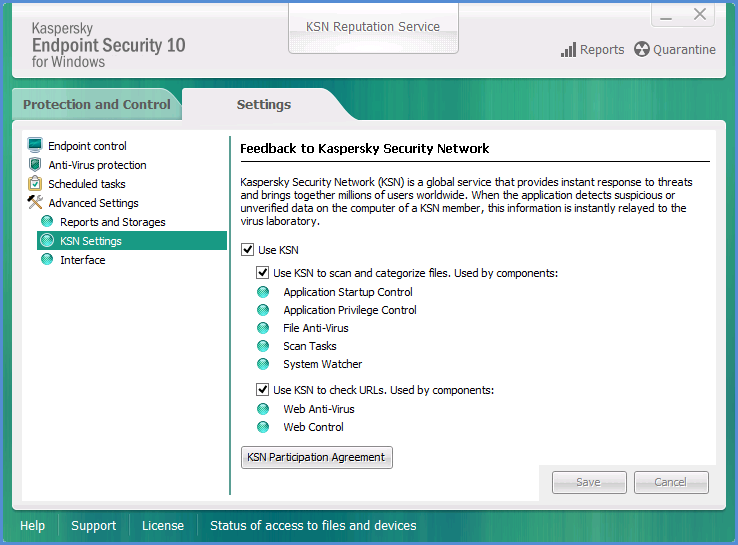 If you agree to participate in KSN, the data is transferred to Kaspersky Lab for the above purposes. Kaspersky Lab protects the information received in accordance with the law and Kaspersky Lab’s rules. Kaspersky Lab uses the information received only in an anonymized form as part of aggregated statistics. These aggregated statistics are generated automatically from the original information received and do not contain personal information or any other confidential information. Initial information received is destroyed upon accumulation (once a year). General statistics are kept indefinitely. Participation in Kaspersky Security Network is optional. You can activate and deactivate the Kaspersky Security Network service at any time by altering the Feedback settings on your Kaspersky Lab product’s option’s tab. Please note, however, if you choose to deactivate the Kaspersky Security Network service, we may not be able to provide you with some of the services dependent upon the processing of this data. We also reserve the right to send infrequent alert messages to users to inform them of specific changes that may impact their ability to use our services that they have previously signed up for. We also reserve the right to contact you if compelled to do so as part of a legal proceeding or if there has been a violation of any applicable licensing, warranty or purchase agreements. Kaspersky Lab is retaining these rights because in limited cases we feel that we may need the right to contact you as a matter of law or regarding matters that may be important to you. These rights do not allow us to contact you to market new or existing services if you have asked us not to do so, and issuance of these types of communications is rare. You view Kaspersky Security Network Statement during the product installation at the Kaspersky Security Network step. Also you can open the statement via the program interface. To do this, open the main application window and go to Settings section. In the left frame of the window, select KSN Settings. In the right frame, click the KSN Participation Agreement button. Figures are for installation of Kaspersky Endpoint Security 10 for Windows on a workstation. They are different from installation windows on file servers by a number of items in the left part of the window.